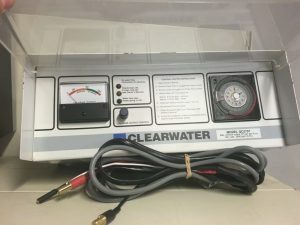 We recondition, service and repair all models of Zodiac Clearwater C Series chlorinators including: C140T, C170T, C200T, C250T, C270T, C330T, QC270T, QC330T. 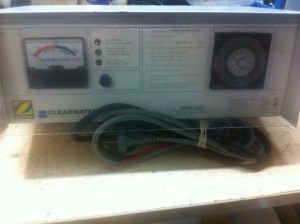 With all genuine spare parts in stock [including: Power control boards, transformers, cells, output leads, output meters, timers, wiring looms, rectifiers all our repairs come with 12 months warranty on parts and labour. Aquamech Services Brisbane are Licensed Electrical Contractors who complete the required electrical test & tag procedures on all our repairs, in compliance with AS/NZS 3760, ensuring the safety of everyone who uses your pool. For more information on our chlorinator repair services click here. To view our range of Clearwater chlorinator cells click here. You can find the C Series Trouble Shooting Manual here. We are conveniently located at 4 Flower Street, Woolloongabba, Brisbane. To contact us call us on 07 3067 7956 or via the online contact form below.